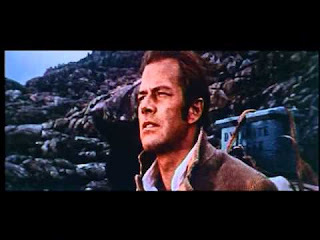 A lively adaptation of Treasure Island as a Spaghetti Western, Between God, The Devil And A Winchester (also known by the more literal translation of its Italian title God Was Once In The West) never reaches any remarkable heights, but remains reasonably true to the genre and the source material. At an isolated wagon stop, the gruff Colonel Bob Ford (Folco Lolli) books into a room at the inn run by Uncle Pink (Roberto Camardiel) and his young nephew Tony. Violent strangers soon show up looking for Ford and the secret treasure map that is generating excitement among local outlaws. Pretty barmaid Marta (Dominique Boschero) is killed, Ford winds up dead, and the inn is set on fire, but Tony retrieves the precious map from its hiding place. Wagon master Juan Chasquisdo (Gilbert Roland), peaceful plain clothes clergyman Father Pat Jordan (Richard Harrison), Uncle Pink and Tony team up to cross the dangerous desert and find the cave where the treasure is buried. Close behind is a group of bandits intent on killing Tony and his group and securing the treasure for themselves. The resourceful Chasquisdo emerges as the linchpin in the quest for gold, shifting his allegiances according to circumstance to ensure his survival and increase the odds of getting his own hands on the treasure riches. An unlikely bond also develops between Chasquisdo and Tony, altering the destiny of all the men. The desert replaces the ocean, wagons replace ships, caves replace the island, bandits replace pirates, and most of the characters are tweaked, but Between God, The Devil And A Winchester is an essentially faithful recreation of Treasure Island, transporting the adventure to a grimy terra firma. Fans of the book will likely enjoy the western re-imaginings, but otherwise some of the plot elements may seem somewhat bewildering. In a movie filled with the typical spaghetti-stained sweaty and smelly characters, veteran Gilbert Roland, at 63 years old, delivers by far the most memorable performance. In the Long John Silver role, Chasquisdo is a cool master manipulator, getting everyone to trust him long enough for him to plan the next move, which almost always involves a betrayal. Tony helps Chasquisdo find a bit of a soul, but his long term prospects remain suitably uncertain. Less impressive is Richard Harrison, blessed with good looks but nothing else, who wanders into the movie about thirty minutes late and sleeps his way through the uninteresting (and unexplained) role of the non-violent (but more than handy with a gun) man of religion. 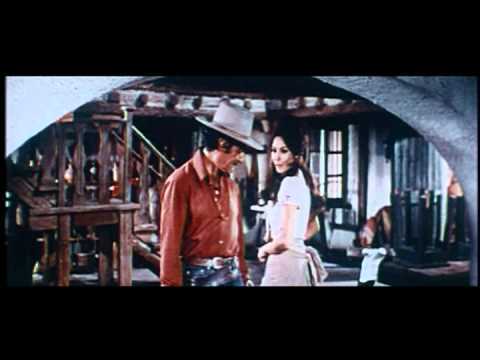 Director Marino Girolami finds a good balance between the inherent violence demanded by Spaghetti Westerns and what is essentially a children's adventure, helped by the fact that Treasure Island was always on the more brutal side of young adult literature. Still, Between God, The Devil And A Winchester errs on the side of more dialogue and less graphic killing, although plenty of characters do meet an untimely and sometimes cruel end. With a more than decent Mexican-inspired music score and some impressive cinematography in the unforgiving desert, Between God, The Devil And A Winchester strides forward with sensibly assured steps in search of buried treasure, a trip that yields predictable death for many, increased wisdom for some, and extreme riches for a very few.